“BARRINGTON, ILLINOIS: THE HORSES NEVER LEFT,” presented at Barrington’s White House, June 10, 2018. The Barbara L. Benson Historical Lecture Series Tickets are on sale now. Purchase tickets here. An excerpt written by Barbara L. Benson for Quintessential Barrington Magazine: My purpose in presenting this program is to give a present-day Barrington audience the significant milestones in the equestrian history of the Barrington area, which has given the greater community its’ identity. While upholding their traditions, equestrians have adapted to a changing environment and are actively working for the preservation of open space. Our story begins in 1831 when Mrs. Juliette Kinzie and her husband John Kinzie, who was the Government Agent to the Winnebago, crossed on horseback through the southwestern part of Lake County on their way to Fort Winnebago in Wisconsin. With their retinue they may have been the first equestrians in our area. The description of their passage from Mrs. Kinzie’s memoir “Waubun” tells us how beautiful the terrain was then. In the mid-1830s the wagon trains came from the east to Barrington Center bringing the Hawleys, the Watermans, the Kingsleys and numerous Miller Families. Powerful draft horses and oxen were their means of transportation and continued to be so, even when the Village of Barrington was established by the railroad in 1854. Blacksmith shops and livery stables were a large contributor to the Village’s economy as it became the trading center for the surrounding countryside. As greater prosperity came to the town, larger houses had their own barns which housed carriages and one or two finer quality horses. Pleasure riding came into village life, as did the spectator sport of racing at the Hawley Brothers track. We will move forward to the early 20th century when the enterprising real estate man Sanford Peck, from his office in the Railway Exchange Building in Chicago, introduced to the Barrington countryside a new group of pioneers who were to take the old farms, and build them into beautiful estates and productive hobby farms. Their families, enjoying the freedom of riding in an open countryside forged the trails and begin the courtesies of good landowner relations which became so essential to the success of the Riding Club when it was founded in 1937 and the Fox River Valley Hunt when it was founded in 1940. 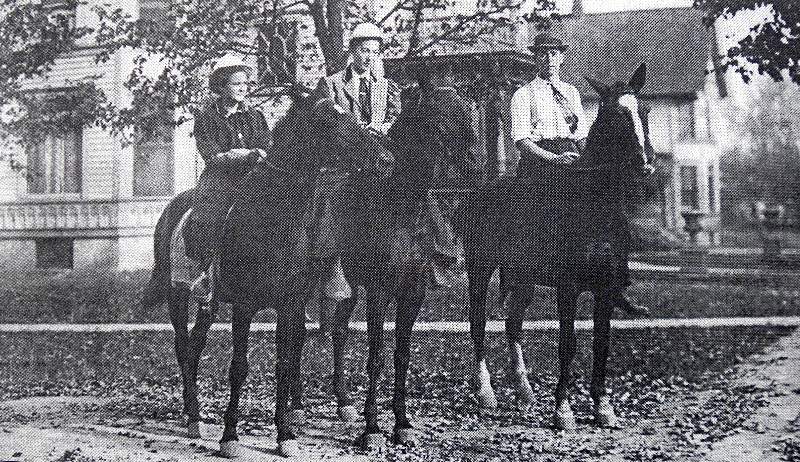 Horse Shows and other equestrian activities brought people to Barrington. There are individuals with renowned stables and even as many of the estates are broken up, new equestrian enthusiasts assemble large farms where equine pursuits are paramount, especially following World War II. The equestrian community becomes active in founding the Village of Barrington Hills, and subsequently supporting the acquisitions of the Cook County Forest Preserve. The Wichman Blacksmith Shop finally closes and the farrier becomes mobile. The hitching posts are removed from town, but the school sports teams keep their equine recognition. Even as the famed Fox River Valley pack of hounds moves to the Stockton area the Hunt members continue Pony Club and riding activities in the Barrington area, with events that can be attended by nonowning horse-lovers. Barrington Hills Farm enters the picture, and in Cuba Township the long-established Grassmere Farms offers the sight of horses freely grazing. Old Barrington Farm saves open space and Walk On Farm offers recognized programs of equine assisted therapy. Not only are equestrian activities pursued for pleasure and recreation, but to support those with disabilities and PTSD. Recognize the Ewings, Walk On Farm, Mane in Heaven, and BraveHearts. Introduce program sponsor Robert McGinley and the FRVHHF. There will be illustrations, photographs, and video. Quintessential Barrington is assisting with producing the program. Equestrian club members are assisting with the “after the ride” tea’s sweet and savory menu. Join us for this one-of-a-kind educational and enlightening event.